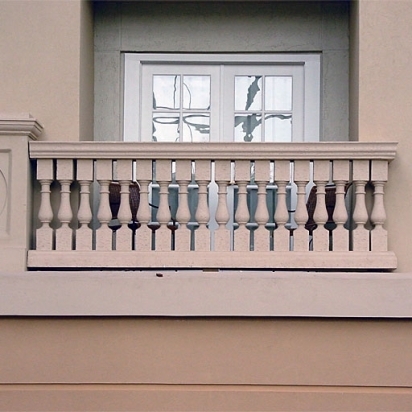 Stromberg Architectural Products manufactures railing for any place in your home or business. Their artisans take great pride in bringing customers the type of architectural railing that’s perfect for their particular needs. Balconies, staircases, pool areas, patios and decks can all benefit from railing in GFRC. Glass fiber reinforced concrete railings need very little maintenance and will stand up to any kind of weather condition. Your balustrade will be built to last. If you want a precise and perfectly crafted staircase, turn to the leaders in GFRC manufacturing. You’ll have the world’s best selection of top-quality railings at your fingertips, including angled, curved and spiral, and the group of professionals at Stromberg will work closely with you to bring your design ideas to life. Stromberg Architectural Products is the premiere source for a wide variety of glass fiber reinforced concrete railings. Stromberg is a pioneer in the use of GFRC and they have the expertise to bring their customers spectacular results. The large number of stock and custom products at Stromberg is second to none. If you don’t see a design you like, they can create something completely original. Customer service at Stromberg provides the vital link you need to help make your project a success. Stromberg GFRC is unique in the world of concrete because it uses glass fibers for reinforcement instead of steel; this makes it the perfect rust-proof product for many applications. GFRC by Stromberg is cast in thin sections and needs no protective concrete covering. This lightweight quality means it installs faster and easier and your shipping costs are reduced. Laboratory and real-life tests have proven the durability of Stromberg GFRC. It can stand up to moisture, salty air, long hours of sunlight and even hurricane force winds. Glass fiber reinforced concrete by Stromberg is resistant to fire. Stromberg GFRC can be fashioned into a limitless number of shapes and designs, as well as textures, finishes and colors. Your decorating dollars will go that much farther when you choose Stromberg for your GFRC railings. When you need GFRC railings, look no further than Stromberg Architectural Products. Their group of experts is dedicated to delivering exclusive, personalized service to their clientele. Experience their one-on-one guidance as they partner with you to make your GFRC railings to your exact specifications. Stromberg offers their expertise with CAD details and design assistance. Contact them today at 903-454-0904 to get started on your GFRC project.